And when you’ve been the President of the Twelve Colonies, and an invitation like that is sent into the universe, what else can you do but respond? 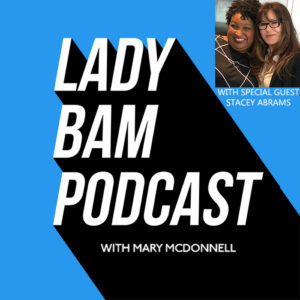 Lady Bam Podcast hit the road, and traveled to Atlanta to meet with the one and only Stacey Abrams. Mary and Stacey’s mutual respect and admiration for each other’s work set the stage for a lively and wide-ranging discussion on politics, what her experience in the gubernatorial election taught her about her passions to effect change for her constituents, as well as the influence that pop culture has played in her life as she’s drawn strength from Woman Presidents, Starship Captains and Police Commanders to inform and inspire her own work as she looks to her political future. Listen now as Leader Abrams and President Roslin’s summit takes place! Mary McDonnell speaks to Dr. Erin Macdonald, Phd.in Astrophysics, and space and science fiction speaker and consultant, on her experiences as a woman in science, how pop culture has informed her life and career choices and much more. 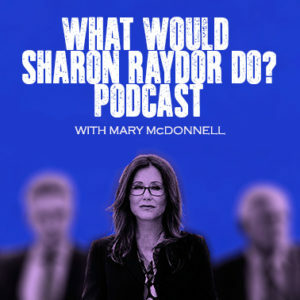 Mary McDonnell reunites with her Major Crimes costar and TV husband Tony Denison as they discuss his early years and experiences in Hollywood, his perspective of the #MeToo movement, and more. 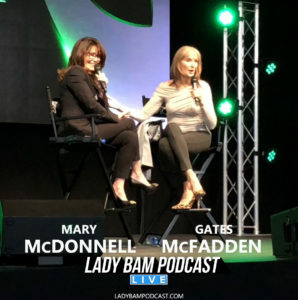 In our first-ever live podcast, recorded at AlienCon in Pasadena, CA, Mary talks to Caroline Cory and Linda Moulton Howe about their work and experiences. Mary talks with her longtime friend and colleague the amazing Katee Sackhoff about Life, Work, and Women! Welcome to the all new Lady BAM Podcast! Follow Mary McDonnell, special guest Stacey K. Black, Mina and Chelsea on directing, taking chances, having multiple careers and putting yourself out there. They also discuss the Parkland Shooting and the courage of students speaking out.